How Do You Spell Peloponnisos? The weather gods were behaving themselves as we pulled away from the wall at Kissamos and headed North past Kithera Island. We ducked in close to have a look see at the wreck just outside the main harbour, the result of Rum induced navigation. The weather window however didn’t quite last until we got to Elafonisos Island, just off the Peloponnisos mainland coast. We were aiming to anchor off one of the best beaches in Greece – according to our reliable guide, Aran, who had sailed his boat in these waters before. Nice thought except the wind was reaching 40kts and the swell was building through the narrow passage between Kithera Island and Elafonisos. So not exactly beach weather…or anchoring off a beach weather. Aran was not too perturbed though as he knew the island also had a quaint little fishing village with some good restaurants. We got there about 6pm after doing nearly 70nm and pulled into the town pier. It was quite a big harbour but with little usable wall, so we congratulated ourselves on finding the last spot on the wall. We then had a wander around the town and out to the cute church poking out on a spit off the other side of the harbour. The restaurant lived up to Aran’s (and our) expectations and we were all fuelled up for an early morning 5am start. Up at the allotted hour, we were surprised to find a small cat had tucked himself in right in front of us. None of us had heard him come in. The weather was looking good so our plan was to press on as far as we could as it was Aran’s last day with us and we needed to get him somewhere close to a bus so he could get to Athens. We rounded Cape Grosso with its impressive old lighthouse and admired the interesting coast as it went by. 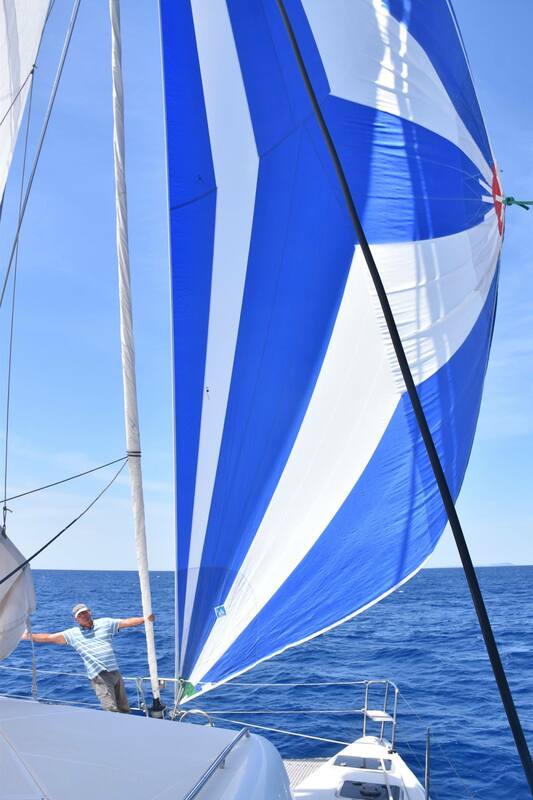 We ended up getting some great sailing in with the wind off our starboard stern quarter. Time to put the geneker up and chew up some miles! and kept going to Pilos in the Bay of Navarinou, where the last great battle involving sailing ships took place. It effectively ended the Greek War of Independence when the British Admiral Codrington sailed into the bay and defeated the Ottoman Fleet that were stationed there. As we sailed in we spotted the very impressive memorial on top of a small island that marked the entrance of the bay. We parked on the town quay opposite a Finnish Coastguard vessel and next to a 48 foot Benneteau with a couple of Americans on board together with Rory, their Irish sailing coach. We were soon on their boat drinking wine and letting the Americans natter away. The six of us ended up going out to dinner to celebrate Aran’s last night with us. Next morning Dee and I said our goodbyes to Aran and then set off to Zakinthos. Or so we thought! This entry was posted in Greece by stull61. Bookmark the permalink.